In the autumn of 1938, John Leakey, the Headmaster of Dulwich College Prep. in London, prepared plans for an emergency evacuation camp to be constructed in the orchard on his father-in-law’s land at Coursehorn. Originally there were 6 wooden huts, some bell tents, a marquee and some camp kitchen equipment. 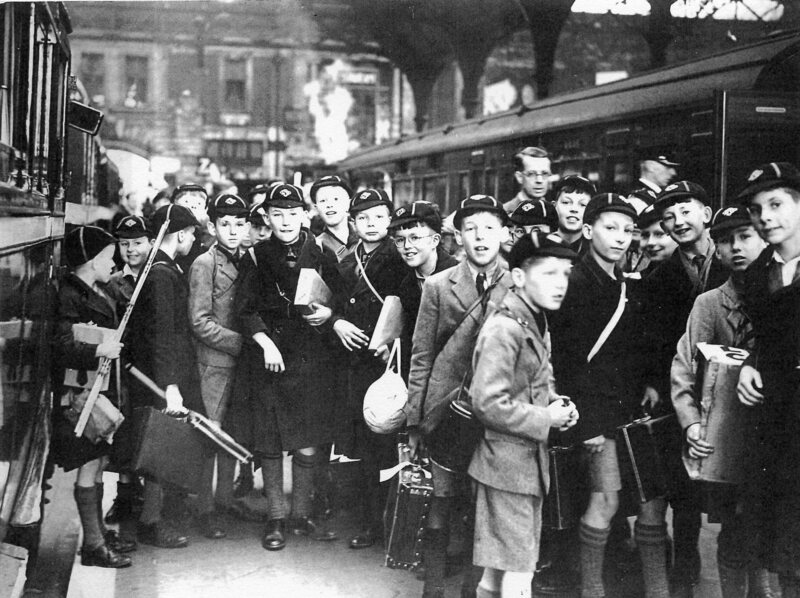 A year later, and after much preparation at the Cranbrook end, on September 1st 1939 the train taking the 135 boys aged 5-13 set off from West Dulwich Station. After 9pm they arrived at Cranbrook Station and in the pouring rain made their way by car and sheep lorry and on foot to the camp three miles away. The camp gradually developed thanks to parents who owned lorries agreeing to send them down to Cranbrook with supplies. There were large quantities of school furniture, books and equipment, lockers, beds, gym equipment, pianos, etc. lying about in the orchard until a semblance of order took shape thanks to Mr Leakey’s wife and her helpers. 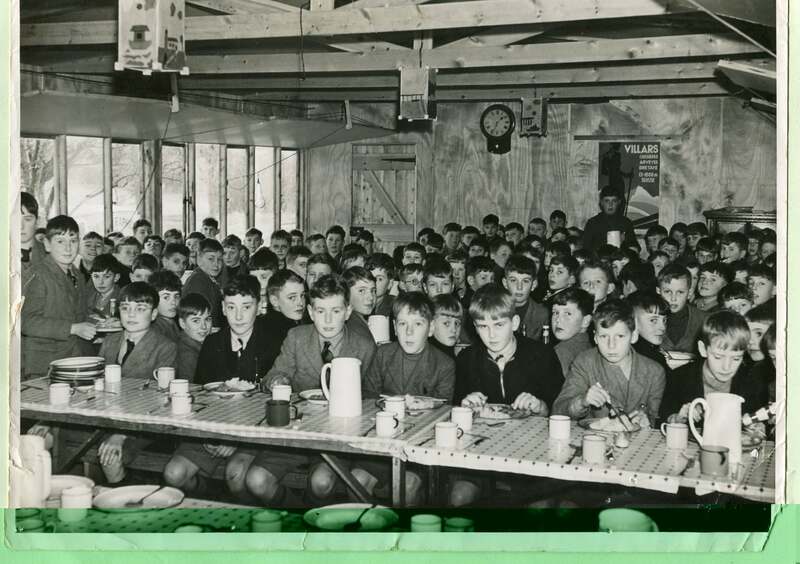 The smallest boys (five and six year olds) were educated in the waiting house at Benenden School under the watchful eye of Miss Dickson. Gradually more beds were brought down from London, and electricity and a tannoy system were installed. Rather than sharing the huts with the boys, staff were able to find some accommodation nearby. At this time, increasingly large numbers of children were returning to London, so Mr Leakey decided to re-open the school in Dulwich in January 1940. The first winter was a fierce one, with thick snow lying all round the camp and temperatures plunging to -15 degrees C. The road to Cranbrook was impassable for three weeks; nevertheless the boys accomplished the journey four days a week without a break. What was worse was the epidemic of German measles and flu! With the fall of France to the Germans, Cranbrook became a protected area prohibited to aliens. Because of the likelihood of machine-gun fire from low-flying enemy planes, shelters were constructed in each lobby by covering the roofs over with two thicknesses of breeze blocks, and erecting four foot walls of sandbags on each side. Eventually, because of the increasing danger and the worries of parents, it was decided to move to the West Country. Accommodation near Lynton, Devon was rented, and Mr Leakey arranged for a train to take the 240 boys and staff there from Cranbrook. Sheep lorries were booked to take all of the camp equipment. Unfortunately, at the last minute, the plans fell through as the hotel was purchased by a rival bidder. Mrs Leakey spent many days hunting for an alternative evacuation base. Eventually she discovered the Royal Oak Hotel at Betws-y-Coed. This was to be the school’s base for the next five years. During this time, Mr Leakey started Dulwich London terms three days before the section in Betws and returned regularly during each term. The London part was seen as being very much an emergency school. Meanwhile, Coursehorn was being used as a camp for the troops, and in 1944 soldiers had been gathered there in preparation for D-Day. In the school in London there were 300 boys at this stage, apparently undaunted by the increasing air raids and the flying bombs. (Dulwich was the third most affected area.) On some days the boys had to be hurried off to the air raid shelters fourteen or fifteen times a day! Bombs fell in the playing fields and within three hundred yards of the school. Within three weeks numbers had fallen to 88. The school had to be closed. 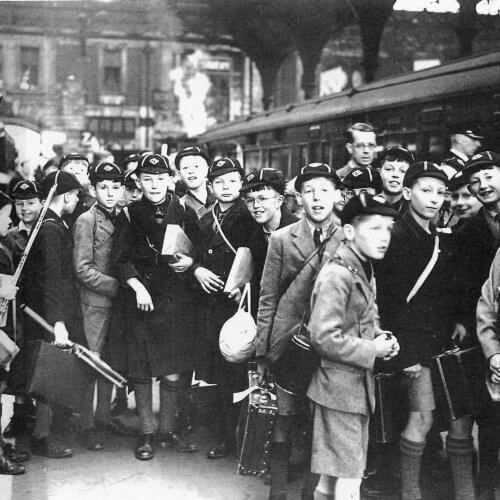 Some Staff and children went to Betws, and some correspondence lessons were set up for pupils who remained in London or went to stay with relations in the country. 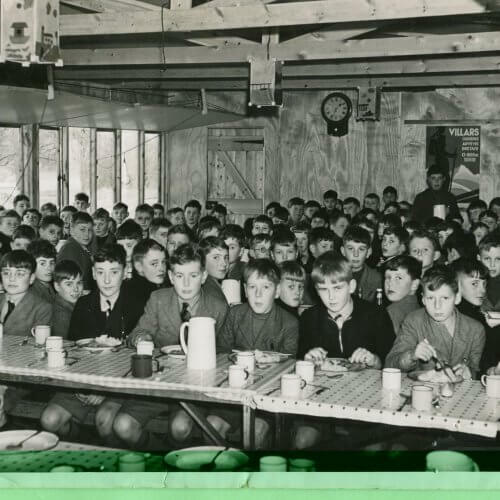 Although the situation was still quite dangerous, the school did re-open that September with 200 boys. In spring 1945 preparations for the return to Dulwich were made. The old boarding house there had been lost in the bombing, so “Brightlands”, a rival school before the war, but which had then been closed, was obtained for the boarders. Unfortunately, no sooner had these arrangements been made than one of the houses took a direct hit from a bomb. Mr Leakey decided to take over Coursehorn from his mother-in-law and use that as the junior boarding house – when the army had vacated it at the end of the war. 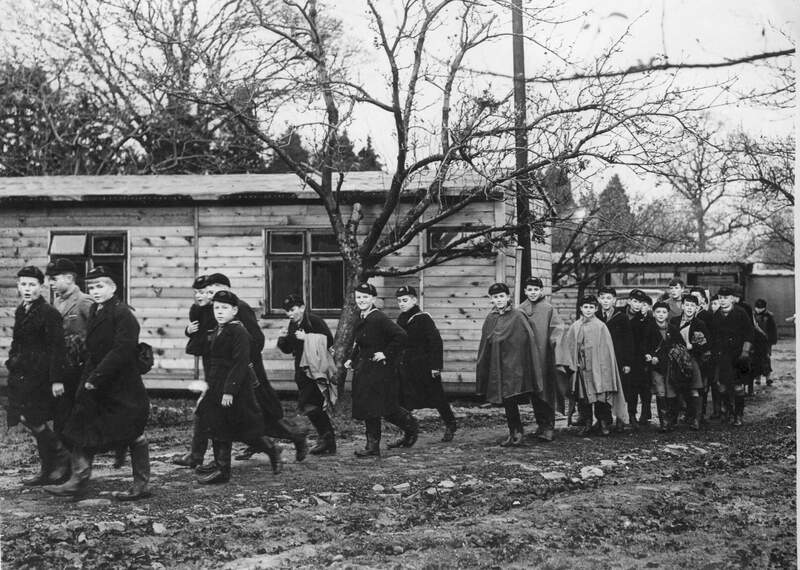 The entire school, both in London and at Cranbrook, was then scheduled to re-open in September 1945. On VE Day in Betws, victory celebrations had been organised by the school: there was a bonfire in the middle of the cricket pitch, and the boys paraded the streets. As a surprise, the Staff were each given a small piece of silver engraved: “D.C.P.S. Cranbrook and Betws-y-Coed 1939-1945”. 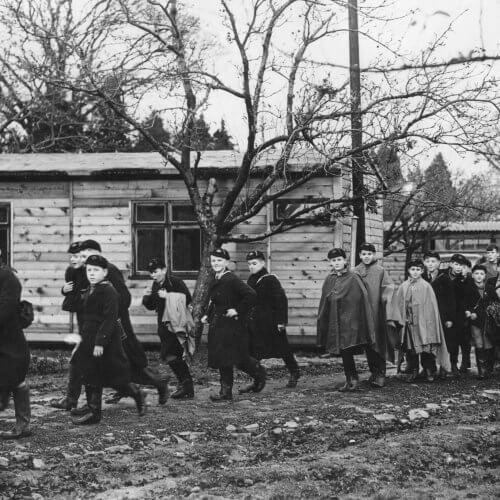 When the army left Coursehorn at the end of the war, there was a slight delay before the school was given permission to use the house for educational purposes, and then, unannounced, the Ministry of Health took over the administrative buildings as temporary houses. Coursehorn began with forty junior boarders (aged six to ten), who then moved on to Brightlands in Dulwich before leaving for their Public Schools, and fifty day boys, mainly the sons of local farmers. The school has gone from strength to strength since those early beginnings, and is now one of the best known and most successful prep. schools in the country. Without the vision and commitment of John Leakey, none of this would have been possible. Text based on “School Errant” by J.H. Leakey, published in 1951.